Earth Day is a time to celebrate our natural resources and commit to caring for our planet. As a farmer, this commitment isn’t limited to one day, but rather stretches across 365 days each year. I rely on healthy soils, clean and abundant water and clear air to ensure good growing conditions for my crops. Farmers are the original stewards of the land and I’m excited to see our story evolve to do more with less. We use less land and water while growing and raising more food than the generations that came before us. Wisconsin farmers live where they work and drink the water that flows under their fields. No one cares about water quality more than farmers who are directly impacted by it. As farmers, we rely on science to help us understand the complexities of how our farms impact the environment. Some of the best on-farm research has been done by staff at UW Discovery Farms, a program that is part of UW-Extension that focuses on the relationship between agriculture and water quality. UW Discovery Farms partners with private land owners to set up monitoring stations that can measure anything from the amount of water leaving a field after a heavy rain to the type and quantity of nutrients in that water and much more. To take things a step further, farmers are teaming up to create farmer-led watershed groups. As the name suggests, farmers in a particular watershed meet to discuss opportunities to be better stewards of the land and share what has worked well or not so well on their farms. This program is successful throughout the state because farmers collaborate to find solutions to problems that directly impact their farms and rural communities. This collaboration of stakeholders allows everyone to have a voice in how and why practices are implemented on farms. Farmers are not opposed to trying new, innovative ideas to help protect and preserve our natural resources – as I said before, I rely on the soil, water and air for my livelihood. In general, blanket regulations that try to be a one-size-fits all approach to conservation are rarely effective. It is essential for farmers to have a seat at the table during water discussions and to conduct on-farm research to see what really works in their area and more specifically on their farm. No matter where you are reading this right now, in a major metropolitan area, small town or rural community, I hope we can agree that clean and safe drinking water is necessary for a healthy life. Changes are rarely the result of a single person working alone, so let’s team up. If you want to learn more about on-farm research or what is being talked about at the farmer-led watershed meetings, reach out and ask. Farmers love to talk about what is happening on their farm and how they strive to continuously improve. Let’s start engaging in more conversations. How can we work together toward the common goal of protecting our natural resources for generations to come? Jim Holte was elected president of the Wisconsin Farm Bureau Federation in 2012. 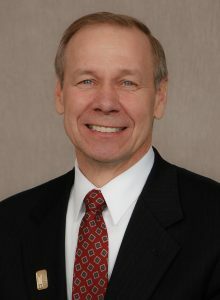 He was elected to the WFBF Board of Directors in 1995. He represents District 9 which consists of the Barron, Chippewa, Dunn, Pierce, Polk, Rusk, Sawyer and St. Croix county Farm Bureaus as well as the Superior Shores County Farm Bureau (made up of Ashland, Bayfield, Douglas and Iron counties). Jim was elected to the American Farm Bureau Federation Board of Directors in January of 2015 as a representative of the Midwest region. Jim grows corn, soybeans and alfalfa on 460 acres of land south of Elk Mound. He and his wife, Gayle, have two children and five grandchildren.